298 passengers were on board the plane. The site of the crash. AN IRISH-BORN WOMAN was among those killed in yesterday’s passenger plane crash in Ukraine. 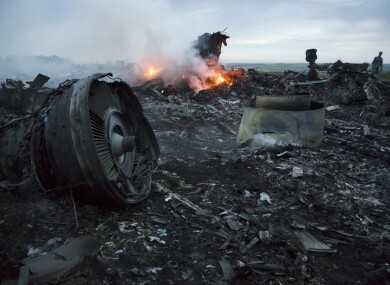 Malaysia Airlines flight 17 is believed to have been shot down by rebel forces yesterday evening. Minister for Foreign Affairs Charlie Flanagan confirmed this afternoon that one Irish-born woman died. “I spoke to her family earlier today to convey my sincere condolences. I assured them that my Department is available to provide any assistance they may require over the coming days and months,” he said. Ireland fully supports calls for a full, independent international investigation to establish the cause of this grave tragedy and to ensure that those responsible are swiftly brought to justice. The Boeing 777 came down in cornfields in the separatist-held region, with the United States claiming it was shot down in a missile attack, a possible casualty of Ukraine’s battle with pro-Russian rebels. The tragedy has triggered world-wide revulsion and calls for the perpetrators to be found and brought to justice. As many as 189 Dutch nationals were killed in the crash. The latest tally also said there were 44 Malaysians, including the crew and two infants, and 27 Australians. Twelve were Indonesians including an infant, nine were British, four German, three from the Philippines, one Canadian and one New Zealander. The airline said four were Belgian but the Belgian foreign minister has said five Belgians were on board. Malaysia Airlines said the nationalities of four passengers remained unconfirmed. Email “Irish-born woman among those killed in MH17 crash”. Feedback on “Irish-born woman among those killed in MH17 crash”.